Burnt to a crisp in a matter of only a few minutes, this poor 986 Boxster didn't even stand a chance. A complete and total write off, to say the least, this car went out in a blaze of sorrow and misery. As the owner of a nearly identical Guards Red 986, this picture made me sit up and take notice this morning while drinking my coffee. I sure hope mine won't befall a similar fate. 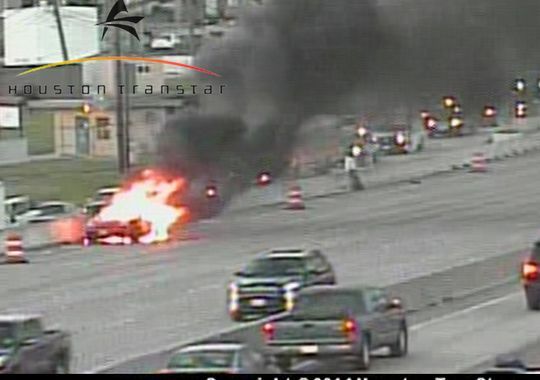 The images were posted to the Texas Department of Transportation's Twitter feed this morning while the incident was still in progress, and appear to have since been removed. 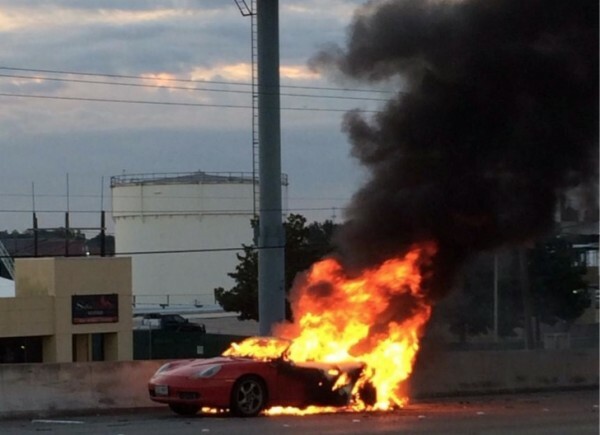 At around 7:10 this morning, the Boxster's engine compartment became completely engulfed, and as you can see, the car quickly lit up like a Phoenix. Due to the inevitable looky-loos, traffic on I-45 was slowed to a very slow pace, funneling down to only a couple of lanes while the clean-up process was carried out. Being that the flames clearly originated from the engine compartment, there are really only a few things that could have happened. Of course it is just conjecture, but the mind immediately jumps to a total engine failure, possibly the infamous intermediate-shaft bearing failure. If this was the case, a hole could easily have been punched in the bottom of the case, evacuating several quarts of hot motor oil directly onto the even hotter exhaust manifolds, leading to a quick starting fire. Of course, the fire could also be attributed to a fuel line breakage or even something electrical. At this point, any forensic evidence of the failure's cause is likely long gone. In an act of sanity and clear-headedness, the driver quickly pulled the Porsche over to the shoulder of the road and swiftly extricated himself from the car, avoiding any physical harm. I can only imagine the feeling of going from the high of commuting to work on a brisk morning with the top down to the lowest low of watching your Boxster disintegrate in front of your eyes. Talk about getting up on the wrong side of the bed.